Malaysia's electoral authorities are rushing through new maps that critics say will further tilt the bias in favour of the long-ruling Barisan Nasional (BN) at a general election expected within the next few months. Despite 16 months of protests and a record number of objections and court cases to declare the Election Commission's (EC) proposals illegal, Prime Minister Najib Razak is expected to table new maps in Parliament next month, the last session scheduled before polls must be held. The EC's redelineation exercise came under fire when a first proposal was unveiled in September 2016 for worsening malapportionment - the difference in the number of voters between wards - and shifting voters to ensure more victories for BN, which surveys say is at its most unpopular since Datuk Seri Najib took over nine years ago. 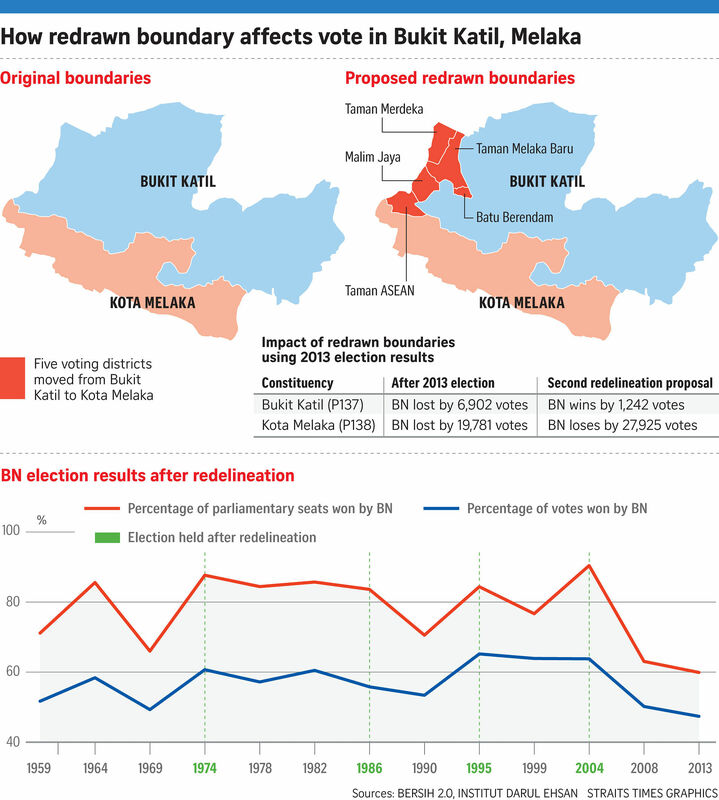 The boundaries, if redrawn, will affect more than half of Malaysia's parliamentary and state legislative seats. Critics say the changes will shift voters from marginal constituencies into opposition strongholds that are packed with more than 100,000 voters but still only represent a seat each in Parliament. Meanwhile BN-controlled seats, like Putrajaya, could have as few as 17,000 voters. The changes largely affect five swing states - Johor, Perak, Melaka and opposition-governed Kelantan and Selangor. BN stands to gain between eight and 10 more seats in the 222-member Parliament if they are approved, assuming voters vote the same way they did in the last polls. It could gain even more as some opposition-held seats have become marginal or more Malay - the ethnic majority which Umno, the dominant party in BN, has been wooing. "This is going to be a very racial election," former premier and now opposition leader Mahathir Mohamad had said of the new maps. After facing over 800 objections and at least 18 legal challenges, the commission has, in its second proposal, withdrawn some changes. The opposition however says the current proposals still benefit BN. Historically, BN's representation in Parliament has always far outweighed its share of total votes cast, and the gap surges whenever a new map - done every decade - is introduced. Professor Mohammad Redzuan Othman, chief executive of Selangor-based think tank Institut Darul Ehsan, said: "BN achieved victory not because they were popular but because they were helped by the redelineation. They won by design." The existing maps are skewed enough that although 51 per cent of Malaysians voted for the opposition in 2013, it won only 40 per cent of Parliament seats. Some estimates say the opposition will need a minimum vote share of 58 per cent to topple BN. But the struggle for Putrajaya could soon get even more difficult for the opposition. Malaysian electoral law allows the EC to send up any recommendation it desires to the Prime Minister regardless of what has been made public previously. Mr Najib will also have absolute discretion to present any proposal to Parliament for approval. Both the government and the commission have repeatedly denied any collusion or favouritism in the process. "Did Selangor, Penang and Kelantan fall to the opposition because the EC helped them?" commission chief Mohd Hashim Abdullah asked in an interview with Utusan Malaysia last month. But for polls watchdog Bersih, which has organised five mass protests against alleged electoral abuses, the EC would already have failed by not fixing existing flaws in the system. "Redelineation should reduce malapportionment, not just avoid worsening it. It is done regularly so that when new voters register, and voters move to new addresses, new maps can correct any imbalance," a spokesman told The Straits Times. KUALA LUMPUR • Malaysia's Election Commission (EC) is tasked by the Federal Constitution to oversee all ballots at both national and state levels. This includes running the polls, maintaining the electoral roll of voters - made up of Malaysians aged 21 and older - and proposing boundaries for each constituency every 10 years. Up until 1962, the total number of voters in each ward had to be within 15 per cent of the average number of voters nationwide per constituency. After that, a concept known as "rural weightage" allowed for those areas to have constituencies that were half the size of the largest urban seat. But in 1973, after race riots resulting from the 1969 elections, a constitutional amendment removed such a cap. The EC is now guided by vague guidelines on the availability of facilities to run an election, "inconveniences attendant on alterations of constituencies, and to the maintenance of local ties" while "the number of electors within each constituency in a state ought to be approximately equal" before accounting for "a measure of weightage for area" given to rural seats. These principles "shall as far as possible be taken into account" by the EC. At the 2013 election, the suggestion that Kapar's 144,000 voters was considered to be "approximately equal" to Putrajaya's 15,000 drew scorn from critics, as have current proposals to create other seats with more than 100,000 voters. Although the EC must listen to all valid objections from state governments, the local authorities - such as municipal councils and district offices - and groups of at least 100 voters from affected constituencies, it is not bound to adopt suggestions. A final report sent to the Prime Minister will include these objections, with a - usually perfunctory - justification on why they were ignored or otherwise. The Prime Minister then presents this recommendation to Parliament for approval, along with any modifications he desires. In effect, he can suggest any electoral map, so long as it is supported by a majority in Parliament.